I found this great poster advertising an adaption of Alfred Bester's The Stars My Destination in an old issue of Jim Steranko's MediaScene magazine. 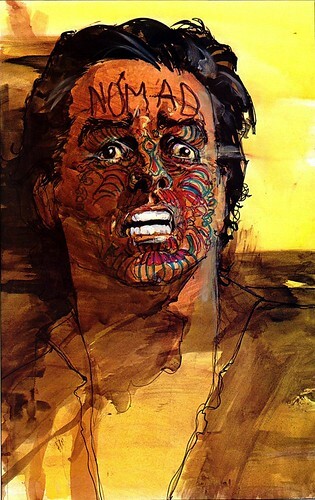 The artwork is by Howard Chaykin and presents a tantalizing image of Gulliver Foyle, especially if you've already read the novel. This was done around Chaykin's late 70s period, after he had drawn the Star Wars adaption and other star-spanning tales. 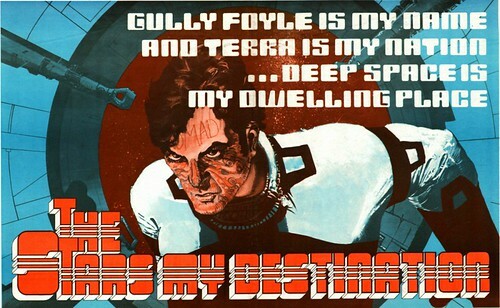 Chaykin worked with Byron Preiss on adapting Bester's classic into a graphically illustrated form. The result was interesting, It wasn't really a comic/graphic novel as the text was left on the side with the illustrations showing a bunch of scenes. I was certainly entranced by the art and images like the above, where Foyle views the tattoos on his face for the first time. Chaykin used a lot of new painting/color techniques that I had never seen before, the effect was unique. Nuff Said!